The Texas Stars went up against the Grand Rapids Griffins for the second time this weekend and once again fell to the Griffins 4-3. It wasn't for a lack of trying - the Stars played hard, putting many shots on goal and Jack Campbell made a lot of amazing saves. 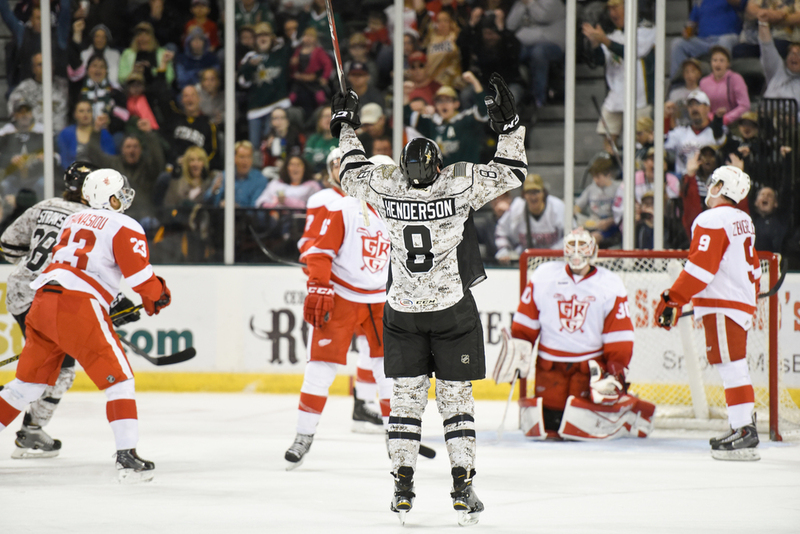 The first shot is Kevin Henderson's goal celebration in the second period. The second shot is a goal by Jamie Oleksiak in the third period. It was a hard shot by the big defenseman and right on target. The puck can be seen by the goalie's pads, heading for the 5 hole. The third shot is one of Jack Campbell's brilliant saves. On first glance it looks like the puck is headed to the net. It bounced over his arm and he still managed to knock it away with the back of his glove.